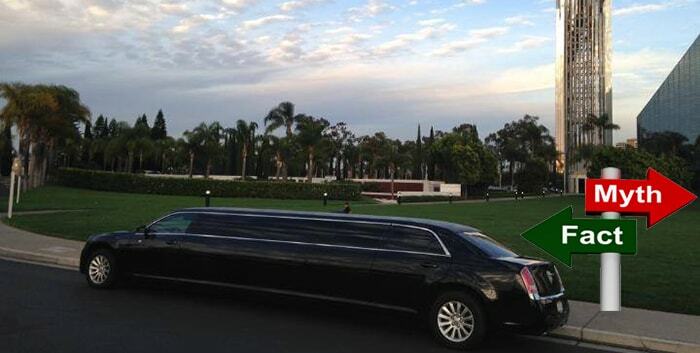 The stretch limousine is an iconic vehicle that is typically associated with wealth and prestige. Most Americans who have never rented or ridden in a limousine themselves gather most of what they know about these special vehicles from pop culture, movies and TV. This leads to some strong and prevalent myths about what limousines are and who they are for that simply aren’t true. If you’ve never rented a limousine before, make sure that you know the facts, and don’t believe everything you’ve heard. These five myths about limousines are easily debunked, but don’t take my word for it. Rent one and see for yourself what’s so special about this special class of vehicle. Those of us who are only familiar with limos through what we’ve seen on the silver screen might get the impression that only powerful business men and movie starlets ride in stretch limos. The truth is that anyone can enjoy the convenience and luxury of a chauffeured ride. If you are in a large group, limos can even be more affordable than taxis, as well as more comfortable and stylish. You don’t have to be a movie star to deserve a special ride for your special day. While it’s nice to get a limo for prom a wedding, or other special events, the truth is that you don’t need an excuse to rent a limo. If you want to travel in style, that’s all the reason you need. A limo adds comfort and class to any ride, no matter what your destination is. In many situations, a limo makes a better choice than a taxi or town car, and the superior service and luxury can make any day feel like a special one. Most people are used to seeing black limos, and uniquely colored ones are often portrayed as special or unusual in films and TV. The truth is that limos can come in any color. If you want to complement your wedding colors, stand out from the crowd or just ride around in a limo that’s your favorite color, make sure to ask what colors are available when you rent. You may be pleasantly surprised. The term ‘limousine’ does not refer to any specific make or model of car, but rather to the kind of service you can expect. A limousine is any kind of stretched luxury vehicle that has a privacy compartment and partition that separates the driver from the passengers, whether it’s a Rolls Royce, a Cadillac or a Hummer. This gives you a lot more selection that you may have expected from your limo choices, and allows you to select the right kind of vehicle for your personal style. Even though many states require people under 18 to be accompanied by an adult, kids can still enjoy the excellent service, comfort and luxury that a limo provides. Riding in style, enjoying snacks and watching a favorite show on a flat screen TV is something that can be enjoyed at any age. Nothing makes a kid feel special like having the door held for them and getting a spacious and special back seat all to themselves.